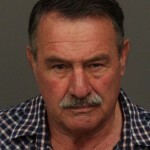 Last Month, San Luis Obispo County Sheriff’s deputies arrested Valentine at his Heritage Ranch home for the Nov. 7 robbery of a Rabobank in Cambria. During the robbery, a man wielding a gun and disguised in a mask demanded cash. According to a search warrant obtained by KSBY, deputies pulled Valentine over shortly after the robbery occurred in a vehicle matching the description of the get-away-car. He talked to officers and was let go. A few minutes later, a California Fish and Wildlife officer approached Valentine, and also let him go on his way. However, a search of the area led to the discovery of a black bag with clothes and shoes matching those worn by the robber and a cardboard note used in the robbery. Five days later, officers again interviewed Valentine at his home. The former Santa Barbara Sheriff’s deputy said he had rented the Hyundai while his truck was at a body shop. Though he elected not to fix his truck because of the cost, he decided to take a drive down Highway 101 to Morro Bay in the rental car. Valentine said he stopped at a liquor store to get a sandwich and a bottle of water, but he did not appear on the store’s video. Valentine said later that night he went to the Tachi Palace Casino in Lemoore. Casino officials said he had gambled more than $300,000 in 2013 and lost more than $16,000. Valentine remains in jail with bail set at $250,000. Guess robbing a bank and gambling away money is different than robbing friends/ family/ and investors and gambling away the money, right? Guess Bruce doesn’t have enough dirt on the ‘big dogs’ to keep him out of jail! When does Gearhart and all his buddies get to pay the piper? Could you be referring to Jim App and his protected-class clique of violent crime buddies? I don’t know Jim App, is he a friend of Gearharts? Gearhart’s friend has left the scene of the crime and can be located in Indian Wells. Jim App as in Paso Robles City manager? I think Mr. Holly met Wade McKinney. How soon we forget. And yes, we was a GREAT friend to Mr. Gearhart, and Mr. Gearhart rewarded his loyalty very well! Robbing a Rabobank. At least the guy has a sense of humor. I think that his real problem is a re-occuring government mindset syndrome, he should be upgraded to a disability pension. As tongue and cheek this may seem, there are real examples being funded that are just as rediculous. you really really really need some language and writing lessons Jorge. You need to really really stop the ad hominems. Try replying with facts to someones statement not attacking the person.